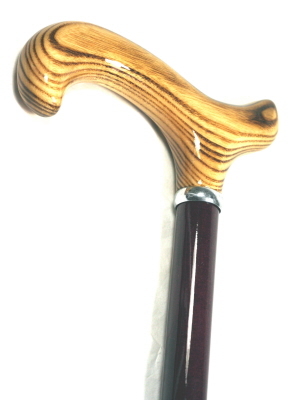 Very stylish polished natural Derby handle on dark burgundy laminated shaft with white metal collar and base metal ferrule. Brown Leather Look Wrist Loop - Great for any walking sticks or canes. Elastic loop attachment that slips easily onto the cane length and position determined by user. Black Leather Look Wrist Loop - Great for any walking sticks or canes. Elastic loop attachment that slips easily onto the cane length and position determined by user. Dark Brown Soft Leather Wrist Loop - Great for any walking sticks or canes. Elastic loop attachment that slips easily onto the cane length and position determined by user.